We're Awakening! : Switchfoot "rounding 3rd base" and nearing home plate (for the new album)! Switchfoot "rounding 3rd base" and nearing home plate (for the new album)! Chad Butler posted a blog for the Friends of the Foot. It is here for all of us non-fotfers, courtesy of Land of Broken Hearts. He's done mixing work for the Highschool Musical 2 soundtrack, and has played drums on several Hanson tracks. So we are nearing the home stretch, the album is almost done. The long-awaited seventh studio album by Switchfoot is on the horizon, or almost. Need to get caught up on how this album got made? Check out our comprehensive time line, which has been updated with this new information! Keep voting for Fiction Family on mtvu. We have two more days to catch up, and are at 19%! Vote vote vote! Switchfoot heading to LA today to mix the record! 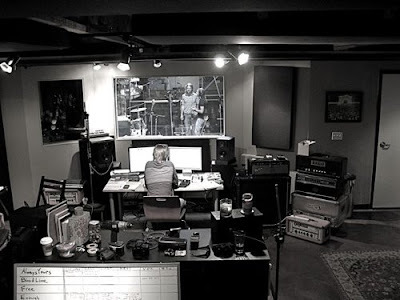 "Jon sang some very special vocals..."
Switchfoot finishing up a song called "Red Eyes"
Switchfoot Official Podcast No. 38 is up! "Holding a cdr in my hand..."
Switchfoot plays Vegas and twitters about it..
Switchfoot, old amps, and Vegas! Keep Up the Voting for the MTVu Freshmen!